Jason and Brandy Nuhfer are fifth generation dairy farmers. Together with Jason’s parents Gary and Amy, they milk about 130 cows at Bar Lee Jerseys in Huron County. As a veterinarian, Brandy helps ensure the family’s cows are healthy and comfortable. 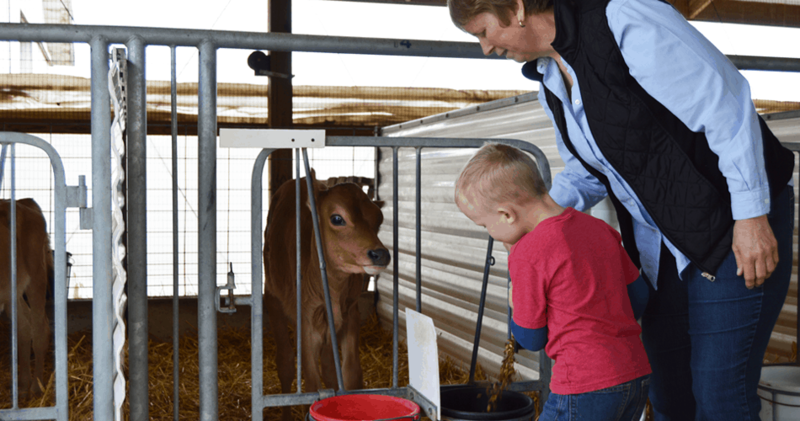 When did you know you wanted to continue your family’s dairy farming tradition? Jason: Growing up, I always wanted to be part of the farm. It was kind of my passion as a young person. I was involved in a 4-H a lot – showed cows and did some other projects, as well. I was very involved in FFA throughout high school. Through that whole time, I knew that coming back to the farm was probably what I wanted to do. After college, in 2008, I came back and I started to do some facility improvements. What have you done on your farm to ensure cows are healthy and comfortable? Jason: Anytime you can make cows more comfortable, they’re going to be happier, healthier and more productive. So, we’ve always kind of kept that in mind. The year I came home from Ohio State, we decided to make some improvements to help bring cow comfort to the next level. We decided to do the free stall barn. We put a lot of research into it. We went all sand bedding in our free stalls, and it’s been outstanding. The first year we brought the cows into the barn, we changed nothing else. We didn’t change the parlor, we didn’t change the feed. We just took them from that barn and brought them in this barn, and we gained 1,800 pounds of milk per cow per year. Hear Ohio dairy farmer Jason Nuhfer explain cow comfort is a top priority when making changes on the farm. What’s it like being able to raise your son on this farm? Jason: It’s a really a neat feeling just I can see him doing just the same things I did. He’s very interested and involved in the farm. He loves to ride in the skid loader and the equipment. He helps Mom in the calf barn all the time feeding calves and hauling buckets. Brandy: He’s always playing with tractors in the house and hauling stuff with his tractors. He gets to have lots of hands-on experiences with equipment and animals, and hopefully that pays off in life to have lots of practical, real-world experience.